This is a product I’ve been testing for quite some time. 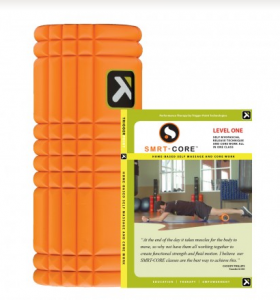 It’s the GRID foam roller and SMRT Core bundle by Trigger Point Performance Therapy. So, what exactly is the GRID? The GRID is a revolutionary foam roller. It has a grid-like foam surface with a varying densities. This foam roller combines the benefits of self-massage and core work. The perfect product for warming up the muscle tissue, removing lactic acid, and increasing blood flow, the GRID is the ideal tool for pre- and post-workout regimens. It’s tough. When I first tried it with the DVD and tried to learn the moves, it was tough. This was not a massage! It felt stiff, awkward and even painful at times. I wanted to wait for my husband to give it a try. He’s more of an athlete than I am and figured he could give more of an honest opinion. The first day after I tried it though, my body felt different. Yes, after the first time. I had to try it again and see. This time I tried doing one of the workouts on the Level 1 DVD. The workout moved quickly and I was able to follow along in less pain than I had the day before. The next day I tried it again, well, you get the hint. I’m a fan. I have to say that there is definitely a learning curve involved, but it has been doing something to my body. I still wouldn’t put this in the area of massage, but it must be doing something. I actually crave using the GRID. If you know me then you know that I hate to sweat and I don’t crave working out much at all. I crave this and I feel stronger using it. It has become un-painful and empowering. I still can’t believe that a simple foam roller can up the intensity of a workout as much as this does. So, what did my husband think of the GRID? He agreed that it was tough and that a learning curve needed to be involved. He had more of an understanding of the massage aspect. Although it hurt a bit the first time the next time you use the GRID was easier because the muscles have relaxed. This is a powerfully strong core workout. He like the concept. Personally, I’ve been incorporating use of the GRID workout before doing my cardio and I’m planing on sticking to this routine for awhile. My core feels strong, as well as my entire body. Although at first it didn’t seem like the workout for me, I enjoy it and look forward to it now. This is something that anyone can incorporate into their workout routine and I highly recommend it. The GRID is also “green”. 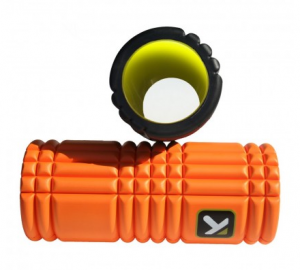 It uses less than ordinary foam rollers and it won’t break down with normal day to day use. It comes with a one year warranty and is easy to travel with you for a complete full body workout. For more information about the GRID and Trigger Point Performance Therapy stop by HERE. Let me know what you think and if you’ve ever tried the GRID! Disclosure: I received this product in exchange for a review. All thoughts are my own. This is the first time I am hearing about the GRID! It definitely looks like fun! Can this foam roller be used by beginners? Yes, it can. It comes with a DVD that helps you learn how to use it.